We all know there are numerous animals out there that could benefit from our magical touch. Whether it is the widely under marketed geriatric patient, agility and working dogs, or the post op patients that never seem to make it to that Rehabilitation consult. We’re always looking for ways to create new sources of referrals and just get the word out there about what we do. Many of us are blessed with working in specialty hospitals with on staff surgeons. Or we are the doctor and therapist in one, referring to ourselves. These scenarios are ideal, and allow for a pretty consist flow of patients. So what happens if we have neither of these sources bringing in patients? Well, you get creative and have to get out there and make potential referring practices understand what you have to offer. Your patient potential is endless… Check this guy out. 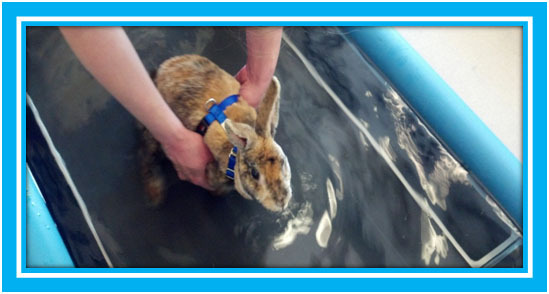 He’s one of the few bunnies I know that does Underwater Treadmill! If you haven’t already done so, make brochures about your Rehabilitation department. Make sure to list every service you offer, and show them off with great pictures. These are very easy to display on counters and offer more of an opportunity for clients to notice them on their own. Create a website specific to rehab if you don’t already have one. This is also a great place to post common at home exercise videos you may prescribe to patients. I can’t tell you how many times clients were impressed and comforted with the idea of referencing a video over the weekend while doing “homework”. Now that you have brochures and a website, it’s time to make connections with potential referring hospitals and doctors. Often having an open house or scheduling time to sit down with potential referring doctors can work in your favor. Be sure to leave copies of your rehab referral brochures and referral forms during these visits. Again, making the referral process as easy as possible is always best. Be flexible. Make sure they know full rehab programs don’t always have to be the only way to go, but are recommended in some cases. If you are using laser therapy or acupuncture, promote this as individual treatments for assisting with pain management. Make sure you thoroughly explain how the consult and appointment process works. This will allow a better explanation to potential clients. My experience is that the fear of cost, especially after a big surgery can be a turn off for some doctors. To work around this, you may try creating package pricing for most treatments. Give some discount for a prepay package of treatment. If you’re currently working with surgeons that do not really believe in the benefits of rehab, this could be your golden opportunity to create a discounted “post op package” and prove what you can do. After time when you’ve won them over with the positive effects of rehab on their patients, slowly increase the “post op package” pricing. It may still be a good idea to keep the in house referral package prices lower than outside referrals. This may be a benefit for both you and the surgeon you’re working with. Ok, so now it’s time to think outside the box. You’ve reached out to potential referring doctors. What about the potential clients? You need to find a way to promote your services to them directly. If your focus is to increase the number of agility patients you’re seeing, take some business cards and brochures and go to an event. You may even contact local training facilities and offer to speak free of charge to their members regarding something simple like stretching before a competition. You could easily review simple and safe techniques without specifically giving direct medical advice. This same concept can also be transferred over to pet owner classes. I have personally held pet owner classes on simple massage, stretching and passive range of motion techniques. I had sent out emails to local veterinarians and posted several signs at the front desk. We used dogs for demonstration, and the classes only lasted one hour. Of course I offered a tour of our rehab department afterwards to show it off! The first time I tried this idea, I had a total of 40 people attend. Within the next 4 weeks, 15 of them scheduled consults. Which in the end, I think paid off for two hours of my time on a Saturday. You have to always remember the wide range of patients we can treat. If your practice sees mostly geriatric patients and you’re comfortable with that, then way to go! If you’re trying to broaden the types of patients you see, you will have to always start with the referral sources. Get out there, be creative, and just think of all the potential patients you could be helping if more people only knew the benefits of Rehabilitation.